"The Day After Roswell" - A Hoax? The historical blackout continues. The government appears to be willing to hint that "aliens" from outer space are behind all this high tech. God forbid it should turn out that it was researchers in the Third Reich. Computer company chief Jack Shulman argues that the transistor could never have been invented so suddenly at AT&T in late 1947 without input from top secret Government projects, that some have identified to him as being from alien spacecraft. Hi, I'm Jack Shulman. I'm the head of the American Computer Company. American Computer Company is part of the Technology International Group and Bell North America group of companies. I'm also one of the owners of the group of companies. I've been in the computer industry for about 28 or 29 years. I've worked for IBM as a professional services management consultant. I worked on the development of the personal computer in 1978 for FIT [Fashion Institute of Technology] and Simplicity Patterns, later adopted by IBM. I developed something called the "pattern creator". That's where we got the term "PC". Prior to that, I'd developed what you might call the first windowing operating system in 1975 for Citibank, and before that there were earlier versions I did for a company called Vydec. I'm a serious computer person - very, very serious - and also someone who's not generally inclined to leap to great predispositions about any unusual subject. Well, as it turns out, a few years ago I got my dose of reality. It was in the form of a visit from a friend of mine. When I was very young I'd got involved in technology, partly by virtue of the influence of a friend's father. I grew up in central New Jersey, which is around where AT&T and Bell Labs originated, and my friend's father was the head of Bell Labs. I ended up at a private school and ended up living at the household of the head of Bell Labs, going to that private school and going to college with his son as a roommate, and I kind of grew up around the various projects at Bell Laboratories in the late 1960s and early 1970s. I'd always held out that AT&T was this rather magnificent institution. Anybody here worked for AT&T in the past? So, you know when I say Bell Labs research, I'm speaking Holy Grail; and in certain parts of the defence community and in government I'm also speaking Holy Grail. Anyone here realise that AT&T and Bell Laboratories ran our nuclear arsenal for 45 years? Anybody who knows that, raise your hand. Not a one of you. I didn't really even know until a little bit later in my career, but I knew something strange was going on because it always seemed to me that AT&T always had what it needed to make innovations in technology, and subsequently such technology would migrate to an IBM or a Sarnoff Research or to an RCA. And I could never really figure out, in the course of my young life, who were these magnificent, incredible scientists, other than that I frequently met them...like a fellow by the name of William Shockley. He was quite a frequent friend to Jack Morton's household, and I knew him, and I knew some of the other folks that he knew, like a fellow by the name of - well, I guess not too many people would know him - Bob Noyce, and Jack Kilby who was an acquaintance of theirs, and so forth. These names, if you've ever worked for AT&T or in the electronics industry, are also Holy Grail names. These are Mount Rushmores of the technology industry. Jack Kilby is credited with the invention of the integrated circuit. I was rather shocked when, about late 1995, a dear friend came to me. He was at one time one of the very well known generals in the Pentagon, a member of the Joint Chiefs of Staff, and is now a consultant. I'd known him a very long time through the Morton family and Bell and when working for IBM. He asked me to analyse some documents that he had in his possession. He showed me some pictures. I kind of turned up my nose. I said, "I don't believe this." He suggested they were pictures of an alien craft. I said to him, "Well, why do you come to me and ask me this?" "Because there are some documents that fell into my possession that I would also like you to see, that go beyond these drawings, these pictures, these photographs, that describe some technology; and I would like you to analyse this technology and make a determination for me of the veracity of these documents, help me to authenticate them." I said, "Fine. I don't believe this is real. I'm sceptical. I don't believe in aliens, I don't believe in UFOs, I don't believe in any of that." And he said, "Okay, well, I'd still want you to take a look at them, Jack." And I agreed. I met with him at his home. I met a woman by the name of Mrs Jeffrey Proscauer. That's not her real name, but it's the name she goes by; she does not want her true identity revealed. And I got a chance to piece and look through some 28 boxes of materials that had come from Western Electric Laboratories in the late 1940s, 1947, early 1948 and beyond, and some subsequent documents. Now again, if you've ever worked for AT&T, you know that the laboratories at Bell Laboratories are often quite distinct, and the documentation from a laboratory is kept in an ongoing, growing tome called a "Lab Shopkeeper's Notebook". It turns out that even in the super-secret laboratories, the ones in the part of Western Electric or Bell Laboratories that manage the nuclear arsenal, these notebooks are kept, and they grow and they're ongoing and they become almost like a living representation of what that laboratory did for a living. Well, such as it is, I was rather shocked at what I had to see there in these boxes of materials, and I convinced them to let me look at them over the course of about three-and-a-half weeks. They were kept at the consultant's house during that time period, and he actually kept a security guard with them at all times because he was afraid that someone might come and steal them. Now of course, I wasn't sure why he was afraid, because at the time I didn't realise the full magnitude of what I was looking at. In any event, after about two or three weeks of looking at them, I came back to him and we sat down over what turned out to be a Christmas Eve dinner, and I said to him: "I've got to tell you something. I'm having a real problem with this because what you're showing me looks like technology that we have not yet developed, that humanity has not yet developed, yet the documents you're showing me appear to be forty-eight, forty-nine years old. This would put them in 1947, 1948, 1949." I suggested to him that before I could proceed I would have to have someone verify the age, carbon-date or come up with some other means to verify the age of the documents, and he agreed. So, with the help of a mutual acquaintance - a private investigator formerly with the Justice Department - we were able to take fragments of the documents without damaging them. We sent them to an expert who formerly consulted for Scotland Yard; he's a fairly well known forensic expert at...I believe it's the University of Edinburgh in Scotland today; he was at a different university at the time. He analysed these fragments of these documents for me, and came back and told me that the ink, the paper, even the presentations were valid; that this was in fact a book or series of books from the 1947, '48, '49, 1950 time period. That took him about four and a half weeks of analysis, and I was for four and a half weeks, as you can imagine, holding my breath. The things that I saw described in this Lab Shopkeeper's Notebook consisted of things that today would be more powerful than the Intel Pentium processor, for instance, or the Cray supercomputer. There were communications devices that were described; there were ways to sandwich-in very, very thin, micrometre-thin layers; special metals to produce moving parts for things like...from the descriptions that I read, the nearest thing I could describe...an anti-gravity propulsion unit for a spacecraft. They included dynamic electronic and power-control technology that even to this day we have not yet developed. They included communications technology that was described only as having been taken from an object of unknown or unearthly origin. The documents were very carefully worded not to reveal what was, in reality, in these boxes of materials. I was sort of at a loss at that juncture, because even though we had forensic information at the time from this particular forensic expert that would date these boxes back to the late '40s, and even though they said "Western Electric, Bell Laboratories", part of them said something called "Z-Division" on them. We knew of the Z-Division: it was a segment of the United States Army, formed in 1947 and 1948. The implications were that this project was operating on the fringes of the nuclear bomb development project - then known as the Manhattan Project Group. It turns out that in 1947 - between '47 and actually late '48 - Harry Truman decided he was going to grant a contract to AT&T to go through the overseeing and management of our nuclear arsenal and the commercialisation of derived product technologies from the nuclear bomb, from the bomb project: the physics, the electronics, the control systems, even the ballistics, the radar that was used, the ICBM technology that was under development in the late '40s after we got a hold of the V-series rockets from the Nazis, and so forth. The contract was inked by Truman in early 1949, if I recall correctly, but during the prior two-year period there was an informal relationship, during which AT&T played a greater and greater role in the organisation of super-secret military weapons-grade projects for the federal government and eventually got pretty much control of what was then known as the Z-Division. Z-Division, believe it or not, originated in Roswell, New Mexico. I guess the reason is, that is where the original nuclear bomb armada was formed - the first bomber wing that carried the nuclear bomb - and it migrated over to Kirtland Air Force Base during the time period when Orlando Lawrence, the Lawrence Berkeley Laboratories fellow, was called in. He was called in by Teller, Oppenheimer...all those folks responsible for the nuclear bomb...Leo Szwilard. Lawrence was called in at the time because he could make accelerators, or "cyclotrons" as they were known at the time. Those cyclotrons were capable of refining uranium, refining plutonium...well, actually, back then, they weren't working with plutonium but with uranium. I guess you could imagine what it must have been like in the time period. They were in the middle of a war when they were building the nuclear bombs and they had to do everything secretly, so this Z-Division was created with super-secrecy as its fundamental core. Ultimately Lawrence was called in because they had to build enough of an accelerator to refine enough uranium to make the bomb possible, and, in spite of all the greatest minds of nuclear physics assigned to the Z-Division in the Manhattan Project, none of them could figure out how to refine enough uranium to make the nuclear bomb a possibility. This was before the first bomb was exploded. So Lawrence was brought in because he knew how to make a cyclotron; but his cyclotron, the biggest one he'd ever created, was about the size of this white board over here, and it could produce about a thimbleful of refined uranium - which would have been about enough to make a nuclear bomb capable of blowing off your left foot. In any event, Lawrence one day is called in and he's asked: "How do we build a cyclotron big enough?" He makes a few calculations and hands a requisition order to Harold Ackerman - today a federal judge, and who was the chief supply clerk for the Manhattan Project - to requisition enough silver to build a big silver racetrack; something like 12 million tons of silver. In fact, he took it to the United States Treasury, handed it to the then Secretary of the Treasury - I guess it was Morganthal - and Morganthal was asked to fill a 12-million-ton order, which also necessitated the relocation of Z-Division to some place where they could put all this silver and build this racetrack. We decided one day at American Computer Company that we were going to be brave. I talked with my board and I talked with some of the people at the company and they agreed. "Yeah, we can try this; let's see what happens." We decided that we were going to take the story that had been conveyed to me about this unusual Shopkeeper's Notebook with these unusual technological artefacts in them, and naively and blithely put a panel on the Internet, describing in black and white and colour what we had found, and raise the question. 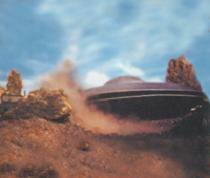 However, the picture that we put up was a picture of Testor's model of the so-called Roswell Lander. It's a picture of what looks like a spacecraft with wings and a jet propulsion system, with a pod in the front to hold alien occupants who were piloting it. We superimposed the picture over an image from the Thunder Range - of course, we picked the wrong place; the Plains of San Agustin was the right place, actually - and we put a little bit of rhetoric on this panel and just placed it right in the middle of our American Computer Company website. Now that probably was the stupidest thing we ever did. Here's this picture of a Roswell alien lander sitting on a panel in the middle of a computer company website, and on it it said something like: "Did AT&T receive stolen alien technologies from the US Government in 1947 and thereby invent the transistor, the laser, the integrated circuit, and...on and on and on...different technologies?" Well, we figured the reaction we would get from the public would be one of, "Oh gee, isn't that cute? That's funny, X-Files, you know..." The reaction we got was not one we had anticipated. Three days after we placed the image onto our website, we received a very strange series of military faxes to our tech support fax machine, referring to a piece of hardware known as "Sky Station". Anybody ever hear of anything called Sky Station? Never heard of it, have you? Well, it's up there. It's an orbital platform of some kind. We were receiving live messages from Sky Station for a day or two and we decided this wasn't right; we were going to call the Pentagon and tell them about it. So I picked up the phone and first I called Fort Monmouth; then I called down to Langley Air Force Base. They wanted to know, "Why are you calling Langley Air Force Base?" Well, where else would I call about a satellite that's sending messages to our fax machine...talk about sounding strange...that say this satellite is about to crash, it's coming down, its communications systems are breaking down. Well, finally we got to somebody who was of authority. It was Colonel James that we got to, and he gets on the phone with me...I'm in my car, on my car phone...and he says: "Mr Shulman, please secure these faxes. Do not let anyone see them. We'll take care of it. We'll let you know what to do with the faxes." It's like...the military goes silent. That next day our offices were broken into. Our front door was smashed, our glass was smashed to smithereens all over the place, and everything was taken out of the file cabinets in our offices. My office was a wreck when I got in there. It was awful. We came in the next day to work and it was like: what happened, what happened? I had these faxes in my briefcase. I'd taken them with me, home. So apparently, by not leaving them there, I probably worsened the situation. It might have been better if I'd left them there, to be frank; if they'd found them and had just come and arrested us, taken us away. They were top level, five-level clearance. We're not supposed to even see or even know such a thing, but inadvertently, as a result, we became aware of the fact that there's an orbital DSP [Defense Space Platform], called Sky Station, which is nuclear-hardened and equipped to carry nuclear weapons, because it was described in these faxes. It is not a very pleasant place to be, to discover that now, here we are at the end of the Cold War with an agreement that there will be no nuclear weapons in space in orbit, and there is apparently a platform up there that the United States secretly put up back in the '60s or '70s or '80s, that's equipped; it's nuclear-hardened, it's one of the Star Wars SDI series, based on Spacelab, equipped to handle and carry nuclear weapons. So now, not only did we have a picture of an alleged alien craft on our website, talking about alien technologies being transferred to AT&T, but we also were in possession of very high level, Level Five, Top Secret security clearance military faxes describing something called Sky Station. That week we had visits from the Air Force Office of Special Investigations. They came up and they interviewed us. They put me through a day-long third degree. We didn't want it happening in the middle of our customers coming in and seeing us or selling personal computers and servers, so I took them to an out-of-the-way part of the office, down the hall, down the elevator to a little office downstairs, and I got a query about everything just short of...well, it included my shoe size, when I was born, names of parents, names of grandparents, when they entered the country, driver's licence number. They went through a Q&A with me and with my staff, that just came short of asking me the wrong question - if you know what I mean. We tried to be a little cute. We put up a picture, and if you go to our website it's still there. If you go to our main website, at the bottom of the page is a nav bar with a pointer in the middle of the corporate info products, catalogue, features, tech support, Roswell 1947, help. You can go to that link and click on it and it'll take you to this special page which, of course, has now grown tremendously. It has something like, we estimate, about 9,000 messages and articles now stored within it. We started off on one Internet server and moved it to five Internet servers, and now we are on one of our super-servers which consists of four groups of four Pentium XEONs and three different service-provider carriers and a whole lot of communications just to handle the load. We get about, we estimate, three million to three and a half million visitors a month to the site. And they're not necessarily people like yourselves, open-minded, interested; they're kids from college, kids from high schools, military people from countries like Iran...I'm serious! I mean, we can track some of the addresses that show up in our logs. I didn't even know Iran had Internet! We've got a very strange reaction to our story. What we did in the story was we isolated a few pointers, some of which only I was privy to. One of them was that there was some relationship between the government and AT&T that resulted in the transistor's invention. I mentioned I grew up in the household of the head of Bell Labs, so I knew that there was something strange about the transistor because I knew Bill Shockley, and Bill Shockley was something of a witless buffoon. There's no way he could have invented the transistor. The symbol for the transistor is made up of three pieces: positive, positive and negative; or negative, negative and positive...silicon dioxide doped with arsenic and boron, in 1947. Now, in 1947, doping things with boron was not easy. It required the sort of equipment that even Bell Labs in 1946 did not possess. They had this type of equipment at Lawrence Berkeley Laboratories - but it would have taken thousands and thousands and thousands of man-hours to invent the transistor. If you look back at it historically, what AT&T was claiming was that one day this "genius", William Shockley, was working with a rectifier; he looked at it and he noticed it had unusual propensities, and there, bingo, he invented the transistor! He figured it out right there! And to verify that, the two other "geniuses" that they got to help work on the transistor, Dr Bardeen and Dr Brattain, both said: "Oh yeah, I remember a guy by the name of Case was [allegedly] talking about transistors in 1931, and I knew back then we were going to have them." That is the history of the transistor at AT&T prior to 1948, other than claiming it was invented in December of 1947 by Dr Shockley. Anybody believe that story? Me neither. And I knew, because the administrative head of the transistor project was Jack Morton - the man at whose house I was staying to go to school and whose sons I was friends with - and he often commented on the fact that it was really a shame that those three idiots got responsibility for the transistor and he didn't. And I always wondered, because he too didn't possess the scientific ability to develop the transistor. He was a brilliant man who had invented the radiobroadcast vacuum tube, the close-spaced triode, but it appears as if he was brought in to head up the project to try to draw back the transistor in time to radio tubes and the things that Shockley talked about; and it was as if the whole thing was just a ploy and he might as easily have been given responsibility and got the Nobel Prize as Bill Shockley. Professional jealousy? In any event, for most of my young life I believed that the transistor had come from a government project and that they were just hiding its origins. Which government project, I did not realise until I saw the Shopkeeper's Notebook in the possession of my friend, the consultant. Now, I'd heard a lot about Roswell in my life and I'd read the Project Blue Book books and I'd read a lot of books like Berlitz's books and so forth, but I was not someone who believed in Roswell, who believed that a UFO had crashed at Roswell at the time, in any event. There I was, stuck with all this information and having created this rather minor scandal on the Internet...well, maybe not minor, with the Air Force coming to visit us. Next thing I know, radio talk show host Art Bell sends science reporter Linda Moulton Howe to my office. She has to be there because she has to see whether or not our offices were actually broken into. A beautiful woman, very intelligent...she shows up at the office with a tape recorder. I'm exhausted...the weeks have been going not so good lately, and we're still picking up the pieces of glass out of the sofas in the lobby. She sees the windows are broken in the front and we have a wooden partition set up to try to keep the air out of the building, and she records me answering questions about all this. I try to be as vague as I can and answer the questions about what's going on here, and she talks about the story. And next thing I know, she plays the tape on "Dreamland", on Art's show. I swear to God, it was the strangest thing we had ever seen happen! That very next day we got well over 3,000 phone calls from people all trying to get in to see me personally; they had to come to see me personally, to tell me about Roswell. We received mail and e-mail by the 10,000 pieces. Our normal 2,000 visitors a day on our World Wide Web site jumped up so high that one of our carriers refused to carry us anymore. At that point I realised there's more than just a casual interest on the part of the public, so we decided we would carry the original ACC Roswell story right through to its ultimate conclusion. We have been for several years now. So, we have publicised the fact that Dr Morton met his untimely death and that Dr Morton was one of the few people who knew the true history of the transistor at AT&T - aside from Bill Shockley who would never have talked because that would have meant the end of his Nobel Prize, along with Drs Bardeen and Brattain, and Dr Kilby who subsequently went on to bigger and better things, and he's dead now. It looked like Dr Morton was breaking camp with AT&T and was very, very outspoken, very angry with AT&T over this whole thing. Professional jealousy, I guess. One day in 1972, Dr Morton was found knocked unconscious and set afire in his Volvo P18 sports coupé, devastating the Morton household and family - my friends - and for reasons that nobody seemed to know. Well, we decided to see whether or not there might be any link, any reason to link Dr Morton's possible migration to a Japanese firm, and we tried to make an inquiry about it with the corporate security department at AT&T. That's when we discovered that there are people working in corporate security at AT&T who don't want to talk about Dr Morton's untimely death. Now, you've got to understand, we're talking about something which happened 25 years ago. So we were investigating further, and I interviewed a member of the Morton household who was talking about the transistor project and got very, very teary-eyed when I talked about the transistor. I said, "Oh, did you ever wonder where the transistor really came from?" It was as if I had cut a jugular. The conversation ended right there. "Can't discuss this further with you." We looked into it a little bit further and it became clear to us that Dr Morton was probably responsible for this Shopkeeper's Notebook working its way outside of AT&T - probably, because he was the principal investigator. Everybody knows what a principal investigator is. Involved in any government project you have a principal investigator. They have to name somebody to take the blame. When AT&T screws up, they have to have someone to fire, and they're certainly not going to pick someone important enough in their view; they're going to pick the one that everybody doesn't like. He was a tough guy; very, very strong-minded; and everybody didn't like him that much, so they made him the principal investigator. There were other people involved, apparently. There was a fellow by the name of Ramey. He was a figure at the Department of the Army. He was named in the documents. There were quite a few other people named in the documents. We're not revealing all of the people at this particular juncture because of Mrs Proscauer who won't allow us to give out certain things. And in order to continue on an ongoing basis having access to these documents and so-called Notebook, we're very cautious about the information we give out. In any event, we decided to depict in a series of pages on the Internet the entirety of the story of what we'd been going through, going on the theory that one of the ways you can protect yourself from, for instance, being assassinated by having information in your possession that's dangerous to others, is to publicise it as widely as you possibly can - which is what we did. Of course, there's a certain drawback to that approach. The drawback was that within no time the attacks, the onslaughts, the assaults, the death threats, the credibility attacks, the undermining of credibility, the public humiliation, pain and suffering began. We found ourselves besieged by what I can only describe as a multilateral black project, which included death threats on myself and my family, death threats on our employees, pictures of me with bullet holes and blood dripping out, on the Internet, out of the blue...a really, really strange thing to have happen. We had people come up and claim they had been hired by us to verify the claims that technology like this originated on an alien spacecraft. And you've got to understand, we didn't say that it originated on an alien spacecraft. We asked the question, "Did it originate...?" Would you run around on the Internet saying this technology came from an alien spacecraft? No. You'd ask the question. You'd say, "Let's put together the evidence; let's find out. e decided we would approach a higher authority, ask the question to the higher authority and make it a matter of public record. So, who is a higher authority, other than, say, Bill Clinton, that you might go to to ask the question: Did the transistor and subsequent technologies fall into the hands of AT&T from the Nazi Germans, the Japanese? Well, neither of them had any of this stuff. Secret government project? Well, the United States Government couldn't build any of this stuff. Half this stuff that we saw in the Notebook...even today we don't even have some of the minerals, some of the chemical materials, necessary to create them. We decided we would ask the Secretary of Defense, William Cohen. In fact, we got William Cohen and then his administrative assistant on the phone, and the head of the Air Force OSI instantly on the phone with us, and sent them a kit and kaboodle of stuff to take a look at. We asked them to come down, take a look at things that we wanted explained in their original context. Well, we've never heard from them about it. We haven't heard from the Air Force or OSI - we filed OSI 9001 pages, demands, with them. We've never heard a single word back from the OSI, the Air Force, the Pentagon. They've kept their distance, accepted the requested requests and violated the law, because under the law, when you give them these demands, they have 30 days to respond. Not a single response. As if to say, "You're not influential enough to get us to respond to these." In any event, we got nowhere with them so we decided we might embarrass them a little bit. Now, how do you embarrass the Air Force? I mean, sometimes they do a pretty good job of embarrassing themselves! But how do you embarrass the Air Force, how do you embarrass William Cohen, the Secretary of Defense, particularly in a time period when we're in the middle of an ersatz situation of war with Iraq, when the Cold War is over? You publish your findings; you have to have findings. I was invited to appear a total of 15 times on radio shows, including Art Bell again, Sightings, the Mike Jarmus Show, ABC News, and finally I turned down the Larry King Live show. I'd just about had enough. I was on ABC News, though, about three weeks ago. We built two of the devices we saw in the Lab Shopkeeper's Notebook. One of them was a semiconductor device. This semiconductor device we called the "Transfer Capacitor", and it has actually shocked the industry. People called me "lunatic" and "liar" and every conceivable name in the book for a period of 11 months as we described the transfer capacitor's unusual capability. It can be made about the size of a molecule, it can be controlled by microvolts of electricity, it produces no heat and it switches at 12 terahertz. Does anyone know what a terahertz is? Intel Pentium's transistors switch at 500 megahertz or some small multiple thereabouts. This thing is 12,000 times faster than the fastest transistors we've ever built. We tested it. We actually went out and got some silver alkane from a company in Pennsylvania that makes semiconductor materials. We built one, we tested it. We then realised that we could build it very dense. We got some friends who operated a company called InMos, who had some semiconductor materials, and over six months - this is two years ago - we built an 8-gigabyte solid-state hard drive in a space about 'yay' big...poker-chip-sized...operating at the same speed, 12 terahertz, capable of replacing the memory of a PC. We subsequently built 2,500 of them and sent them out in the form of test kits for people in industry to evaluate - people who refused to believe that such a thing could exist. We sent them to Rohm & Haas; we sent them to Intel. We got some of them back. People didn't even want to look at them: "What is this nonsense?" Motorola wouldn't take one, interestingly. Texas Instruments took one. In any event, for six months I had to put up with some of the most obnoxious, insulting, nasty comments you could imagine, even when I was at meetings of my own professional conferences. "The crazy alien guy with his flying-saucer transistor" - that was typical. Ultimately what bailed us out was that a friend of mine who used to work for IBM, now for Lucent, managed to convince his private funding agency to give Lawrence Berkeley Laboratories a grant to check us out at ACC. He picked Lawrence Berkeley because they probably have the highest integrity of all the physics laboratories in the world - the ones who had the 10,000-foot racetrack, made out of 12 million tons of silver, that in 1947 must have knocked Henry Morganthal right out of his leather chair when it was requested. They tested using the same procedures, but they had a much better laser than we did. We only had a little laser at Princeton. They had a big laser with which they could watch the movement of electrons, and they verified not only the function but the speed. So, Lucent managed to double-check our work, even though it won't officially admit it. What the "T-cap" or Transfer Capacitor really is, is a metal-insulated dielectric junction semiconductor based on silver alkane. It works on the principle whereby electrons strike the bond in question, elevate its energy level and, boom, what was an insulator becomes a conductor in a half of a millionth of a billionth of a second! Very fast! It persists for about two thousandths of those millionths of a billionths of a second and turns itself off. We use two of them in a pair, one to refresh the other, and they nearly never lose any electrons. Once we charge them up, they stay charged for an hour. So we only need a tiny bit of power to power them. They produce no heat. We can't measure heat from these things because the heat, if it were there, is absorbed back into the substance, the silver alkane, because of its unusual propensities. Now, everyone who has ever owned a PC knows how much heat today's computer microprocessors generate. It's unearthly! And the faster they get, the more heat they generate. The power they consume is being turned into heat, like a toaster oven. That's why people call PCs "video toasters". This thing, if it were used to replace the transistors, the 130 million or so throughout your PC, would produce no heat. Instead of consuming 150 watts, it would probably consume one-thousandth of a watt. And it's been sitting on the shelves for nearly 50 years! In any event, we've got this story, and 9,000 messages and news items about it. Really strange things and people that come on: a fellow by the name of Wang on the private alleged web identities of two very public figures; fraudulent publications about ACC; hackers who hack into our website. If you go to our website and read through it, you'll be truly amazed. You'll be stunned, you'll be shocked. You will also walk away no longer a sceptic, if you were. If you're someone who believed, you will now see what I call "third party circumstantial evidence" that verifies that something very unusual happened in New Mexico in 1947. We recently received, courtesy of the Russian Federation, a transcript of a statement on the subject by Leonid Alexiev. Leonid Alexiev, a Russian General, chaired a blue-ribbon committee to look into this in 1997, when it was brought to their attention when Bill Clinton went to Russia and some students stood up and said, "We saw this website called American Computer, and there it was said that the Defense Department has a UFO in the United States. Is this true, Mr Clinton?" Bill got up and said, "I don't know. No, no, it's not true. But wait a minute. I tried to ask the Defense Department, but they wouldn't tell me." In any event, the Russians decided to put together this committee, and I don't know if they spent the millions of dollars on our account; they might have. They sent us a copy of the transcript of the report by Alexiev, which was also carried on The Learning Channel, TLC, last week. The Russians have decided there's an alien presence in our solar system, based on all the evidence, on these things they've examined. They've somehow got a hold of pictures of our transcapacitor from our lab. I don't know how, because we've never taken any. Leave it to the Russians! The KGB doesn't exist anymore; it's called the MSB now, right? And Alexiev has gone public, as have the Russians, and as a result of his report he has now been appointed by...what's the name of the head of the Russian Republic, the drunken guy? Yeltsin...Boris has appointed him head of the Russian Space Command. As an aside, we thought we would solicit a few senators' opinions. We solicited the offices of Senator Kennedy - another man who likes the glass of wine occasionally. In any event, we got a very strange reaction from the office of Senator Kennedy. They sent us a folio about a study that was done on funding, that was publicized by the Senator's office. In the middle of it they had yellowed out a section that talked about the deep space probe series that NASA is sending out - the Deep Space 1. I think they're naming them after that Star Trek show, Deep Space 9. When they get to nine, I don't know what they'll do! In any event, Deep Space 3 or Deep Space 4 is slated to receive a piece of equipment called a "laser cannon". At Lincoln Labs there's a funded project afoot to develop, on a rush basis, an offensive weapon based on laser technology, because wherever this deep-space probe is going, they believe they need it. Deep space is the space outside of the solar system, or at the extreme ends of the solar system. Apparently Senator Kennedy was one of the sponsors, but the senators and congressmen do not hold the same opinion as the Defense Department and the Air Force about whether there's an alien presence in or right outside of our solar system. So, right now, that's about where we're up to. We're starting to commercialize the transfer capacitor and look at partners; we're going to get it out there. We figured, why not? We've spent so much money on the research investigation, we might as well see if we can sell these things to people. British Telecom has jumped in and stated they've placed a letter-of-intent order with us. They're using it in a product they call the "Soul Catcher" chip [see Global News, NEXUS 3/06, Oct-Nov 1996]. We've had some preliminary discussions with a company called Shipley, the world's largest manufacturer of semiconductor materials. We've had discussions with Intel, IBM. Just in the last few months, a guy from IBM said, "You should have been dealing with us all along." "Well, why didn't you come to us?" "Well, I'm coming to you now." "There are a lot of people who are interested." "Well, we're IBM." "So? You had these in your lab all along and couldn't get them to work!" We're not sure what direction it's all going to go in, but I just wanted to end with this. This morning, as I was going up in the elevator, I felt like I was hanging upside down, holding the world up with my feet. The next time you get in the elevator out there, think about that. That's how we feel at ACC.